The Red Rose farming family of J C Walker & Son, of Brennand Farm, Dunsop Bridge, Clitheroe, secured a supreme and reserve championship double, plus top price honours, on Craven Champions Day - the annual show and sale of commercial store cattle with future show potential at Skipton Auction Mart. (Wed, February 16). The 2011 Craven Champions Day supreme title winner with, from left, exhibitor Rob Walker and judge Matthew Keel. The Walkers, reserve champions at the corresponding fixture last year, stepped up to secure the title for the fourth time with a 12-month-old British Blue-cross heifer, which had earlier won the young handler class in the hands of 16-year-old Rob Walker. The home-bred daughter of the Walkers' stock bull, Brennand Viper, out of a Charolais cow, sold for £1,150 to Steven Swales, of Melbourne, York. A ten-month-old Limousin-sired heifer, out of a British Blue, shown by Steven Walker, was overall victor in the halter-led classes, before going on to land the reserve championship, selling at £1,020 to Phillip Summers, of Clayton, Bradford, who was buying the runner-up for the second year in succession. He will parade his budding bovine baby on the show circuit this year. The Walkers’ first prize Limousin-sired steer secured top price in show at £1,200 when joining another buyer from Clayton, Michael Priestley. The non halter-led championship fell to an 11-month-old home bred British Blue-x-Limousin bullock from David and Linda Broadbent, of Greenhouse Farm, Midgley, Halifax, sold at £900 to Thompson Bros, Pickering. The Broadbents also exhibited the first and second prize youngsters in the halter-led British Blue-sired heifer and steer classes. Stephen Swales bought both class winners – the heifer at £1,060 and the bullock at £1,000. 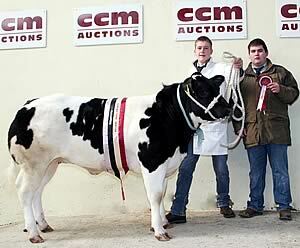 Philip Summers also acquired the second prize heifer at £1,040. For good measure, Mr and Mrs Broadbent were also responsible for the first prize unhaltered British Blue-sired heifer, sold at £890. Brian Lund, of Walshaw, Hebden Bridge, sent out the top priced entry in the non halter-led section, the second prize British Blue-sired heifer, which returned to Calderdale when joining Stephen Maskill, Hebden Bridge, for £980. Mr Lund also achieved four figures when selling his third prize halter-led British Blue-sired heifer for £1,000 to James Middleton, Arncliffe. The British Charolais Cattle Society sponsored two breed-sired show classes, with the leading performer the first prize heifer from Alan Burley, of R & K A Burley, Sigsworth Grange, Wath, Pateley Bridge. The seven-month-old, sired by neighbour John Cheetham’s stock bull, sold for £900 to Richard Critchley, of A A & E Critchley & Son, Hutton, Preston. With 521 head of cattle forward on the day, store bullocks averaged £685.32, store heifers £643.58 and young bulls £697.99. Other show sponsors were Laycocks Agricultural Chemists, Skipton, Ian Mosey Feeds, York, Timberworks Fencing Supplies, Settle, Robertshaw Myers Financial Solutions, Skipton, and Huddersfield-based agricultural agent Janet Sheard.